Add an exciting splash of color to your next social gathering with these simple yet classic Choice black colored beverage/cocktail napkins. Let these 2-ply cocktail napkins spice up your table or catering tray by helping to pull together any themed birthday party or holiday get-together. Our black beverage napkins are perfect for that sophisticated cocktail party or prom, and can help to put the finishing touches on your Halloween party! Classic square beverage napkin used to protect tables from stains. This large 250 pack comes in a nice black color. I recommend this product. Great napkin. We first bought these 10 inch beverage napkins for a catering gig off-sight, after seeing how nice they looked we switched to black full time in house. Our Top choice for pure black cocktail napkins. The black cocktail napkins are great for displaying a cocktail to a customer and its black is Dark Black not a light black like most dark napkins. We use choice black napkins for all of our cocktails. Decent napkin. Worked well for our beverage stations and dessert bar. They are simple. Thin but not bad for a 2 ply napkin. Would buy again. Extra strength, comfortable to hold and doesn't tear when wet. Color also doesn't rub off when wet, so no worries there! Adds elegance and class to any event or setting. Great quality for the price! These were ordered to be used in the after reception bar. The color was so vibrant and matched the bride's color scheme perfectly. I liked that it added a perfect touch of elegance to the event. I recommend these highly and will order again. They are also super absorbent and not flimsy at all. Great napkins for the price. These napkins were exactly what we wanted and needed for our three bars. The napkins were sturdy and didn't tear. These napkins are great for your beverage. They are thick and durable! You get to choose whatever color you like. Great price for a great product! These are our standard bar napkins and they can’t be beat for quality, price and color options. They are simple and perfectly sized for beverage napkins. Wanted to get these customized but the price jumps quite a bit. They are fine as plain cocktail napkins but probably could be available for cheaper. These napkins saved us a tremendous amount of money by switching to webstaurant.com and we get a really good product at a lower cost so we are very happy! these are my go to napkins. a nice quantity for a very fair price. the quality of these is very nice also. these are great for a party but also nice for everyday use. These naps are sleek and super durable. Love how elegant they are under a cocktail n our bartop! Perfect size and we find ourselves using them to even take hot plates out to guests because they're thick. These Choice 10" x 10" 2-ply beverage / cocktail napkins are incredible value and have the look and feel of a much more expensive product. We buy a lot of these! Great quality. We got them in black and burgundy for the bar and they add that extra detail to the speakeasy versus just a white napkin. I could not be happier with th quality of these beverage napkins. I bought them in multiple colors every time I have an event to host. These napkins are elegant and complement any bar or dessert table well. They are absorbent and come in a high quantity for the price, making them a great choice for our events. We've been very happy with these bev naps. We like the look of the black on our bar top, especially with a nice cocktail glass on top. These seem a little more stiff/starched than other bev naps so they are easier for us to grab out of the stack. Great price - we always order a large amount to get a volume discount. Black beverage napkin is great for any drink, appetizer, or finger food. Classic color for any event or party. Customizable and very affordable. Highly recommend. Great napkins that can be used at any event! I use them for coffee service, simple receptions, dinner service, pretty much any event that might need napkins. Love these napkins! They look great under your drink and they absorb really good! They come in a variety of colors so you can find the color you need! Great napkins! These are super black and don't feel cheap at all. They have a good weight, and I'll order them again when i need to! Great little napkin for cocktails, coffees, appetizers, or desserts! Comes in a variety of sizes, can be customized for your event or business, and is large enough to unfold for more versatility. 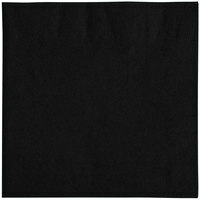 Ordered these black napkins for my son's upcoming graduation party. They are the perfect size and are great quality. They will work perfect for what we want. These cocktail napkins are basic, but for the price they cannot be beat. We have used them for serving cocktails, beers, and even wine. They are not the best napkins for cleaning up big spills but if use as intended they will provide great value. Black beverage napkins are great for any bar, restaurant, party or reception. This 2 ply napkin is absorbent and looks nice under a glass. Textured edges add even more class to this bev nap. This napkin solved my issue. I was having to use multiple napkins of a different kind because they were too thin and the guests were complaining. This napkin I use one and no complaining. Very Nice! These napkins are great, they are thick and they don't lint up. We use these for every event we have. I will continue to purchase these. We buy these napkins in Black and Red and they are great for the bar. They are not thin and cheap looking but don't cost as much as the napkins from our food vendor. Love these napkins and come at a great price. They are really nice and sleek looking but also do great an absorbing water when we set our glasses on them. small pack of bev naps is perfect for a small party or reception that doesn't require a full case. These are a high quality 2-ply napkin that will impress your quests and customers. The Voice 10"x10" Black 2-ply beverage/ Cocktail Napkins are a high quality napkin. The feel of the napkin is high quality and provide our customers with a high quality beverage napkin. Perfect Perfect Perfect! The Choice 10" x 10" Customizable Black 2-Ply Beverage / Cocktail Napkins - 1000/Case works great for the bar, we will be ordering more and the shipping was fast too. Best deal on standard black cocktail napkins. Classy, good quality, doesn't shred. Customers like it too, especially in summertime it's a must to put something under the drink. These black beverage napkins are perfect. They do exactly what the ones I used to buy at double the price do. They do not look cheap either. Choice's cocktail napkins are a great buy. They are sturdy and reliable. The black color looks great and the size is perfect for serving drinks and appetizers. These napkins are perfect for parties. Def add a lot more color to the party va the regular white colored basic napkins. Much superior in quality also to the regular napkins. Used the Choice 10" x 10" Customizable Black 2-Ply Beverage / Cocktail Napkins - 1000 / Case to hold Doritos. Great for snack time 4 little ones. Arrived very fast to my home. These are without a doubt the best value around. We use several of the big suppliers for our To go and paper goods and we have found that even with shipping, these are the best price. The quality is fantastic as well. We order about 20k at a time and this seems to be the best value. These are almost identical to the black bev naps at a popular restaurant store, but are considerably cheaper. We just order a few whenever we order other stuff. Standard quality, good enough and look much nicer than the white naps. These napkins are a great choice for cocktail napkins or for appetizers. They are a solid black color and do not run if they get wet. Wish these were a little more affordable. We use them for our catering events only, because they get spendy at our bar in our restaurant. Nice quality. Great product! I order these in black for our cafe/bar. I used to order them from one of our suppliers at twice this price, for the same bev nap. No shortage in quality and no skimping in size. They are exactly what you find in every bar, cafe, restaurant, etc. They come folded and stacked and ready to use. Each case of 1000 come in 4 individually plastic wrapped rows of napkins, and fit perfectly in the box they are shipped in. Completely protected from the elements. Easy to open and very easy to store. And yes, I have reordered these again and again. If you are worried about quality, you need not...these are perfect and very reasonably priced. Nice and thicker than expected, strong enough to hold its shape if folded into a design. Used on cocktail, drink, and even dessert /cake table. I'm a caterer and find myself coming back to Webstaurant for 99% of all of my catering, baking, cooking, service needs. Can't beat the price for this 1000ct case of black beverage napkins. True in color (not dull or faded looking) and true to size. Would definitely recommend this brand. We purchased the choice 10" x 10" Customizable Black 2 - Ply Beverage / Cocktail Napkins - 1000 / Case. Worked well with serving drinks. These Napkins are great looking and is much cheaper from what sysco is selling them for! they are great looking and looks great for your cocktails! These are really great cocktail napkins. I really like them a lot. They're a great price and black goes with everything too. If I wasn't going broke trying to open my business I'd buy a lot more of these to hold onto for when they go up in value someday. But, alas, I am nearing an empty wallet and the attic is already full of other paperware collectibles so I must refrain. I give the napkins a 5 star the price is great the quality is great I have passed it on to others whom or looking for napkins at a great price. These napkins are the perfect size! We run a transportation company and they fit perfect in our cocktail glasses. I will continue to order from WebstaurantStore since they are so much cheaper then anywhere else I can find! These beverage napkins are very good and cheap ( price wise ) they are half the price i was paying from my food provider locally . We love the rainbow colors that they come in, I've ordered alot of products from webstaurant, they help my business run smoothly and I like how fast I received my product, but I think there shipping is getting very expensive. I really like these napkins for corporate orders. The color is vibrant, they are nice and thick and they do not bleed when wet. Very happy with this product. I have to say I was a bit skeptical about the quality of these for the price, but when they arrived they were of decent quality and a spectacular price. I only wish there was a larger case quantity size. I compaired these to some of the big brands. They absorb the same, dont wrip and hold up the exact same. We now buy in bulk to take advantage of the savings! I cant tell the differance between these and the big brands. Except when it comes to the price!! Simple black napkin made the appetizer sampling a great success. The quality of these napkins are unbeatable. The design on the napkin adds a luxury look. Great choice! Perfect cocktail / beverage napkin. The color was great. Nice and thick napkins. These will work great for my dessert and snack bars. Great Price. Perfect napkins for the price. Any color as well. Black blended in very well with the theme and the quality of the napkins is much better than I had expected. Sturdy napkins of any color at a great price how can you go wrong?